Atto390 - is one of a new generation of fluorescentlabels with a coumarin structure. It has a strongabsorption at 388nm, a high fluorescence at 468nm(extinction coefficient 2.4 x104 cm-1M-1) and highquantum yield. Click here for other labels available in the Lightning-Link® range. Dylight® 350 - is a derivative of AMCA with a vibrantblue fluorescence that is brighter than AMCA and itsAlexa equivalent Alexa Fluor® 350. It has a strongabsorption at 354nm, high fluorescence at 432nm(extinction coefficient 1.5 x104 cm-1M-1) and highquantum yield. Unlike standard AMCA labeling procedures, where a large molar excess of AMCA is employed, the Lightning-Link AMCA kit combines a low molar ratio of AMCA:antibody and high labeling efficiency to eliminate the need for purification steps. AMCA (aminomethylcoumarin acetate) is a blue fluorescent dye commonly used in fluorescence microscopy, arrays and in-situ hybridisation. It has an excitation wavelength of 352nm and a maximal emission of 452nm. DyLight® 488 provides green fluorescence for a wide array of fluorescence labeling-based applications. It has a strong absorption at 496nm, high fluorescence at 524nm (extinction coefficient 7.0 x104 cm-1M-1) and high quantum yield. Primary applications of DyLight® conjugates include immunohistochemistry, western blotting, ELISA or immunofluorescence microscopy. Click here for other labels available in the Lightning-Link® range. R-Phycoerythrin (R-PE) is a fluorescent protein from the phycobiliprotein family, and is isolated from red algae. The absorbance spectrum of R-PE covers a broad wavelength range, which provides an advantage for multicolor immunofluorescent staining or flow cytometry as a number of excitation wavelengths can be used. R-PE is one of the most intensely fluorescent phycobiliproteins and has orange fluorescence. It is significantly brighter than conventional organic fluorophores. R-Phycoerythrin (R-PE) is a fluorescent protein from the phycobiliprotein family, present in red algae and cryptophytes. It has three maximal absorbance values of 498, 544 and 566nm (the optimal will depend on the application), and it has a strong emission peak at 580nm. RPE is closely related to B-Phycoerythrin (B-PE) and these are the most intense fluorescent phycobiliproteins providing an orange fluorescence. RPE conjugates are commonly used for immunofluorescence and flow cytometry and are ideal for multiple labeling with other fluorochromes. Click here to view other fluorescent proteins and dyes available in the Lightning-Link® range. Fluorescein is one of the most popular fluorescent reagents used in biological research because of its water solubility, intense fluorescence and high absorptivity. It has a peak excitation occurring at 498nm and peak emission of 532nm. Fluorescein conjugates are very popular for flow cytometry and immunofluorescence and are also used for immunohistochemistry. Click here for other labels available in the Lightning-Link® range. 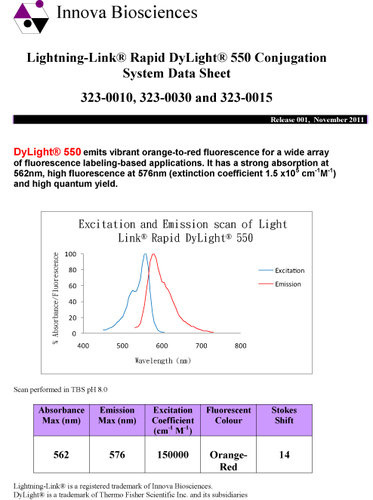 近紅外光DyLight® 755 DyLight® 755 provides far red fluorescence for a wide array of fluorescence labeling-based applications. It has a strong absorption at 756nm, high fluorescence at 794nm (extinction coefficient 2.2 x105 cm-1M-1) and high quantum yield. DyLight® 800 provides near infrared fluorescence for a wide array of fluorescence labeling-based applications. It has a strong absorption at 776nm, high fluorescence at 798nm (extinction coefficient 2.7 x105 cm-1M-1) and high quantum yield. 可以應用在ELISA. immunofluorescent. Flow. confocol. Western Blot等檢診及分子病毒之研究! !直接在一抗上做標誌 (可標誌螢光蛋白 螢光dye HRP Biotin等) 只要一個步驟 回收100%。這個方法克服二抗所造成的背景值過高及Host來源不同所造成Crosstalk的現象. 近紅外光DyLight® 800 provides near infrared fluorescence for a wide array of fluorescence labeling-based applications. It has a strong absorption at 776nm, high fluorescence at 798nm (extinction coefficient 2.7 x105 cm-1M-1) and high quantum yield.